The Xiaomi Redmi Note 4 finally went official last week as two versions of the affordable phablet were unleashed via China Mobile. In the run-up to the launch, it was believed that the Redmi 4 would also debut alongside its larger cousin, but it wasn't to be. Having been spotted about a month ago on Geekbench with Qualcomm's Snapdragon 625 SoC and 3 gigs of RAM on board, the device has just certified by TENAA powered by an alternative chipset. 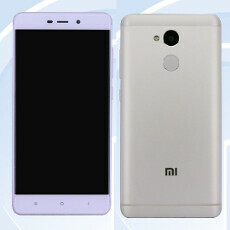 Carrying the model number 201606, the Xiaomi Redmi 4 will apparently launch a gold color variants along with the silver model depicted. As you'll notice, the design pays homage to the Redmi Note 4's exterior with similar camera positioning and antenna lines. Arguably, though, the Redmi 4 doesn't look quite as premium. In line with previous speculation, there'll be a 5-inch display, which looks set to offer full-HD 1080p resolution. If accurate, this would come as a welcome upgrade on the Xiaomi Redmi 3's 5-inch, 720 x 1280 panel. The noted 1.8 GHz processor is likely the MediaTek Helio P10, though it remains to be seen whether the aforementioned Snapdragon 625 version will also be released. Elsewhere, the Redmi 4 should bring 3 gigs of RAM, 32 GB ROM, 8- and 13-megapixel cameras on the front and back respectively, and a very substantial 4000 mAh battery. The listing also references an IR blaster, which isn't too surprising given that the Redmi 3 also includes this feature, while the rear image of the device confirms the presence of a fingerprint scanner. As one might expect, the device will get Android 6.0 Marshmallow out of the box. Since the Redmi 4 has passed through TENAA, we'd expect the device to become official very soon. Set to cost 699 Yuan, or around $105, we'll have all of the details covered here once it arrives, so stay tuned.